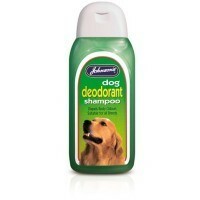 Johnson’s Dog Deodorant Shampoo leaves your dog smelling fresh for longer! This sweet smelling shampoo thoroughly cleans your dog’s coat, leaving it glossy and revitalised. Washes away easily, it clears away any odours. The deodorising properties of this shampoo continue to keep unwanted odours at bay long after bathing your pet.